When I look at this photo, I don’t see a cute bathtub scene. I see an 11-month old infant about to undergo a nightmarish surgical trauma necessary to save his life, and his 27-month-old brother who cannot fully grasp what will happen, but who will nonetheless be indelibly influenced by the fear, uncertainty, and disruption of everyday life that lies ahead in the coming months and years. I remember going into the bathroom to take this photo because I wanted a shot of Matt’s chest before it was cut open. I didn’t really care that he would have a scar running from just below his neck to the bottom of his rib cage, but I did want to capture a memory of the baby who had not yet known that kind of suffering; the tiny boy who was still untouched by the first of many wounds to come. Of course, I also was keenly aware that this little one might not survive to have another bathtub photo taken. I am certain that anyone who is reading this also has a story to tell, a story equally tender and strange and rich with joy and sorrow. My wish for you is that you will remember your story, all of it, and use your camera or art or music or words to commemorate your journey. more tools and became”toolboxes on wheels”..It got me thinking about the last 5 months. smart and wise choices and decisions daily about their life and think we have to”rescue” them. how to ride a bike.. Better yet, I like the one about 2 drunks trying to help each other up. I once read a story about a someone I believe was in the United States Coast Guard. and”dont get overwhelmed and drown in ‘their world of being drained mentally”. and feed them on time lol) May everyone who read this be encouraged and blessed. Raynard, it’s such a hard lesson to learn, when we want to help a loved one who doesn’t want help, no matter how much they need it. Or even when they do want help but are somehow unable to accept it in any useful way. I agree there are times when we have to take a step back. Often the only person we can influence in a situation is ourselves. Matt’s neurologist once met me at the ER at about 6:00 am (having heard Matt was there, unable to sleep for two days due to severe mania). He begged me to go home and get some sleep myself, promising me that he would make sure Matt was taken care of. “If you go, he goes,” he told me, and that was the beginning of my realizing that sometimes the most important thing I could do was keep myself from drowning, figuratively speaking. I’m happy you were able to enjoy a peaceful day off AND I’m super-glad that you have some terrific animal friends to be there with you to share the fun. Thanks for being here and sharing your thoughts with us! Oh! Thank you so much for this blog today. I needed to see that sweet little face to let me know that we all go through the bruises and trials, but we carry on. Matt is such a strong person. All the things he has been through. I was just praying for him and all your family. You were the first thing I prayed about this morning while walking. I hope Jeff is doing good and all is well. Julia, I just want you to know I have appreciated all your love and compassion showed to someone you didn’t even know. Your words of kindness helped me so much and still does as I read Defeat Despair. Some days are easier to defeat it. I love that Christ put you and your family in my life. Have a beautiful day and let Jeff and Matt know I keep them also in my heart and prayers. Cherie, I’m so glad you found the blog helpful. Matt is a strong person. After Jeff’s first surgery he said that he was only beginning to understand some of what Matt has been through for 30 years. I am so grateful that you are keeping us in prayer. I really am convinced that prayers are keeping us afloat, and I love thinking about you talking with the Lord about us while you were walking. Jeff is doing well, all things considered. He had to miss his last chemo treatment because his blood count is so bad now that they often can’t treat him. The up side of that is he feels better when he’s not on chemo. I tell him when his blood count is slammed that maybe it means his cancer is getting slammed too. I too am very happy we found each other on this blog. I feel a deep joy to think that anything I write here is helpful to anyone else. I appreciate so much your words of encouragement. Hope you have a wonderful week! Thank you Heba! I’m so happy you are here, and I really appreciate your kind words and encouragement. Oh my, I love the picture! What a blessing Matt is and so sweet . I am so happy that I got to be part of his life while you all lived in Bartlett. Now we keep up with each other, like this, and we will be getting together again soon. Lord willing Jeff and I will get and stay well. Love your story and love you all. Take care and hugs to all. Carolyn, you were truly the brightest light of our time in Bartlett, and I have been so happy to be in touch with you often via this blog. Many years have come and gone, kids grown up and having kids of their own, and yet us not aging at all, hee-hee. YES we will be getting together again before we know it…meanwhile just remember that we love you and keep you in our hearts and prayers. Deeply moving. Yes, I have pictures that remind me of stories/life and invoke feelings associated with those stories. Thanks for reminding us to capture those moments. Thank you, Barb. As I’ve said before, none of the nearly 800 posts of this blog would be here if not for you. I really believe that. Thanks so much for being a great example of faith and support! Well, once again, your story made me cry! My son had to have a surgery when he was about that age, too, and it was very scary! But it wasn’t life threatening they said. It was still scary to see him going into that operating room on a gurney and not be able to go with him. Fortunately, everything was fine for him as well. Thanks for sharing your story! Patsy, that’s such a hard moment when they take your tiny son away from you and wheel him into the OR. It’s terribly traumatic regardless of how “serious” the surgery is (anytime one is under anesthesia it’s serious). That first open heart surgery in 1986, my mother and Jeff’s mother were allowed to come back into the pre-op room with us where we were allowed to be with Matt until he was sedated prior to anesthesia. Both of them were with us as we said goodbye to Matt before the surgery. After the nurses disappeared with him down the corridor, we turned and saw both our mothers crying (I can count on one hand the number of times I can remember seeing my mother cry). Later, a close friend who is also a grandmother told us “they were not just worried and hurting for Matt, they were worried and hurting for you two as well.” We have much to be thankful for just being able to share our stories here, knowing that they (and we) survived! Thanks for being here. You are an extraordinary woman, Julia. you’re a gift to your family, both the one you’ve made and the ‘family’ like me that gathers around you. I have a school photo of my unhappy little boy scowling at the camera. Sometimes I wanted to throw it away, but it serves as a reminder of how far we’ve come. You find the most amazing quotes to accompany each post. This one is no exception. Alys, your friendship, kindness and support are precious gifts to me. I so appreciate your presence here. Yes, sometimes the most poignant photos are the ones where there are no smiles. I treasure Jeff’s first grade photo, which I fell in love with the first time I saw it. (Neither he nor I went to kindergarten, both starting to school at age 5, since we had a late fall birthday.) In the photo, he’s not scowling, but looking scared and sad. As you say, these photos mark the times we might otherwise forget (or deny), and remind us of how much we have survived and achieved. So many of us have less-than-happy memories of at least a few of our school years. I am so happy that your son is now starting to COLLEGE! Such stories lift my heart with hope in the midst of so much uncertainty. Awww…what a precious photo to have of Jeff. Isn’t it interesting how endearing it can be to see our spouse at such a tender age? Mike’s family had lots of photos, and we’ve inherited all of them. We had everything digitally transferred so we could share with his brothers, and hopefully one day with our boys, too. Yes, school wasn’t always easy, was it? I felt like an ugly duckling through most of it, tall, skinny, awkward with a Canadian accent and freckles to be made fun of. Good times. NOT! You are so fortunate that Mike’s family had lots of photos. Having them digitized will be a gift that keeps on giving to the family in the years to come. I too was an ugly duckling for most of high school. It’s hard to imagine now that I was ridiculed for being skinny. I tried so hard to gain weight. Amazing. Looking back at photos now, I realize I looked no different from what many magazines push as “ideal size” now. But of course, high school popularity is a very subjective thing, and being nerdy seems to draw the persecuting predators. But mainly what it did for me is make me appreciative of being an adult. I’m SO GLAD to be a late bloomer! It’s a bit of a relief becoming an adult, isn’t it? That’s a good way to phrase it. We don’t understand it when it’s happening to us, which is why it is so painful. Hindsight is 20/20. If only we could get it when we were young. It doesn’t excuse bad behavior and trust me, when it was directed toward my young son, I didn’t feel terribly charitable. I think people of our generation are enjoying so many more opportunities in retirement, which takes much of the sting out of getting older. I honestly feel no envy for young people today, but I hope that the benefits available to people our age (financial and otherwise) are still around for them in 50 years. That’s a great analogy, Julia, one of the voodoo doll. It is extraordinarily painful bearing witness to your child’s exclusion, bullying or pain in any form. They were among my hardest as a parent. Does Matt have activities that allow him some socialization? Yes, Matt has a very special person in his life (Darla) who had a brother with disabilities and remembers what it was like to experience how he and the rest of her family were excluded and avoided. A big part of her life has been devoted to advocacy and activism for people with disabilities. On an informal level, she takes Matt to many community activities (in fact, they are going to some sort of festival today) and with her, he has been able to participate in Kiwanis, which he loves, and probably knows more people in York County than we do, because of going with Darla to so many community activities. I am so thankful for her! Also, the students of the College of William & Mary (especially the Greek Life organization) have been fantastic friends to Matt and others via the Arc of Greater Williamsburg. They host Matt and his friends for a yearly carnival, occasional bingo nights at their student center, attend athletic activities with them, and many other similar events. These young people give me great hope for Matt’s future. Julia, this entire thread gives me great hope. It also makes me want to weep. We have to look a little harder for the wonderful people in the world, those that won’t judge or dismiss or overlook the good in people, even though they’re different. I’m happy to hear about Darla, Kiwanis, and all the great opportunities for Matt. Thanks Alys. I said long ago that being Matt’s mom has shown me both how cruel or uncaring people can be, and how wonderful they can be. Without intending to be, he is sort of a litmus test in showing me more about people I know, AND about myself. I am grateful for those who have reached out to him in love. I remember when we finally found Pine Hill School. It felt like an oasis for both Chris and the rest of us, a place where he was accepted, made friends and calmed down and learned about himself. Just prior to that, we had been turned away from another school. I sat sobbing in the car, uncontrollably and finally called the friend who had recommended it. Her daughter is bipolar so she knows the drill. Cruelty is everywhere, but kindness is everywhere too. Our boys made us work a bit harder to find it. Julia, that is a good way to look at it. We become better people when we have to stretch and grow beyond our boundaries. I’ve also met wonderful people as a result of the challenges we’ve faced, people I might not have otherwise found. That’s a good thing, too. It really is. There are so many people I’ve been close to, whom I might not have thought I had much in common with otherwise. That’s one thing I used to love about staying at the Ronald McDonald House. There were all sorts of people there, most of whom were not demographically similar, but the bond of support was instant and strong. For those with enough faith all things are possible. Every scar has a story. The majority of which are a testament to someone’s enduring courage and love. And, as such, is a worthy offering to the glory of God. Thank you, Alan. Your comment was a source of reassurance and joy to me today. I am so happy you are here. My four sisters and I sat for a group portrait when our oldest sister, at age 47, was on the first steps of the journey into glioblastoma multiforme. That type of brain cancer is most aggressive and, 20 years ago, its terminal grip took her life in merely 10 months. Kathy, thanks so much for sharing your story and the link to your article. I am sadly familiar with the GBM diagnosis. When Jeff was in dental school, I worked in the neurosurgery division of the medical school, for an NIH-funded brain tumor study which administered Phase II and Phase III experimental chemotherapy protocols. Over two-thirds of our patients had the GBM diagnosis and as you say, it’s a devastating illness. More recently, our dear friend was diagnosed with it on Christmas Eve 2010, and died almost exactly 6 months later. So it’s a diagnosis that continues to frustrate the doctors and researchers in their relentless attempts to find a cure. As you may know, that’s also the type of cancer that Senator Edward Kennedy had. I love it that you and your sisters all wore head scarves for the photo. It’s a strange feeling, I know, to look at smiling faces knowing the sorrow that lies within, but the ability to smile on through the pain is one way of winning the war even while losing the battle. I think how lucky your sister was to have not just one but FOUR supportive sisters! I know it must have been invaluable to her during her last months on earth. Thanks again for sharing your story with us, and especially for the link! I agree with your observation that those who face such trials with courage are leaving us an example to follow in the troubles that will inevitably come into our own lives. Your sister’s example will be with you always. Good morning, Julia! That’s so beautiful. A good part of what makes your story so compelling is your perspective. What someone else may consider tragic or insurmountable, in your heart, mind and hands is noble, heroic, brimming with hope, and ultimately triumphant. Of course, we know Who blesses you with this grace. Thank you for being this vessel and carrying all that light to share with us. Thank you Susan, for your kind words which are a balm to my soul. When I read how beautiful you make it sound, I think how messy and conflicted and tired and resentful I feel so much of the time. Your words give me something to which I can continue to aspire. It is easier to be a conduit through which divine grace can pass, than to keep trying (mostly unsuccessfully) to be a source myself. It helps when I remember the mercy and grace isn’t coming from me and ultimately has very little to do with me (or any of us) except insofar as we pass it along, and let it keep flowing. Thanks for being part of that stream of mercy. Oh thank you, Julia, it is so true. God never stops and gives up, and for that, I am ever grateful. My mother lost a son at 18 mos. to measles/pneumonia. Merry, those losses must have been hard for your family. I am so grateful that some of the childhood diseases that terrified our parents and grandparents are now largely eradicated due to vaccinations. Your husband’s niece sounds like a remarkable person. I’m sure her example lives on. Thanks for being here and sharing your thoughts! Good morning sweet Julia xo As I read your post, I’m struck by the events in your families life that for most, would have perhaps hardened them. Not you ! You maintain your sense of fun and humour and are a delight to all who are lucky to spend time with you. I’m certain if it had been me, I would have taken this precious photo thru a veil of tears and scared the bejeebers out of those little cuties. Now that I really see how tiny Matt was just before his first surgery, I’m even more amazed at his recoveries and yours too. You are a force! 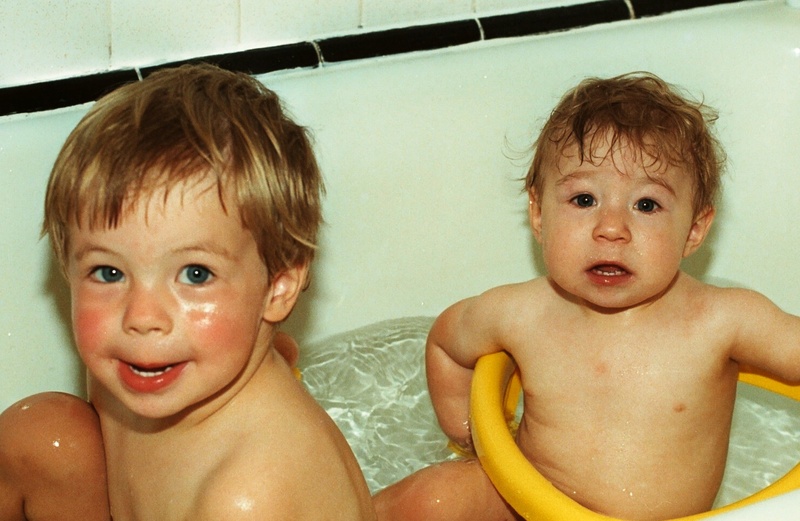 I also remember baths together as pre-schoolers. I actually have a scar on my chin to remind me. We’d race each other to the tub to sit up close to the tap because that’s where it was warmest. But speedy little Boomdee slipped on the damp tile floor and went chin first into a cast iron tub……crash! A few stitches later, I wear my badge of honour. Yes I was the quickest and also the most clumsy of us all. I have other scars to support this. If there’s anything remotely dangerous to fall on, slip on, knock into, I was always able to find it. K, I did my share of crying, but I tried to keep it behind closed doors. However, when I first found out Matt had to have that surgery soon (we always knew it was coming, but they wanted to put it off as long as possible to increase his chances of survival), I was in my room crying and Drew (who had just turned 2 at the time) came in and asked me what was wrong. I told him that Matt’s heart was broken and they were going to have to fix it. He got quiet for a minute and then said “They’ll fix your heart too.” 🙂 ❤ BTW Matt only weighed 18 pounds the day of his surgery. He couldn't eat much because just the stress of eating wore him out, his heart function was getting so low. His hair used to be plastered to his little head with sweat by the time he finished taking a bottle. I loved reading about your shared bath time. I wonder if little kids still crowd into the tub together, or is that something that has disappeared with "modern" times and houses with more than one bathroom? WHOA, your slip-and-fall could have been so much worse, but I'm sure it was still traumatic for everyone. I would never believe you were klutzy from being around you. I have always been totally clumsy myself…people are always asking "where did you get that bruise?" and half the time I can't even remember since I've grown accustomed to bashing into things. There have been a couple of times when I think I nearly knocked myself out hitting my head on the car door! I'm glad you arrived into adulthood not too much the worse for wear for having a few bumps along the road. Awwww, young Drew seemed like a smart and sensitive little tyke. Given what you’ve shared about grown up Drew, I think that hasn’t changed. Most little ones might even shy away in that situation, but given that he asked you what was wrong, takes a certain maturity. I’m thinking he was probably a really caring big brother too for little Matt when he was on the mend. Isn’t it interesting the personalities we seem to be born with. Seems that while there’s many influences on us growing up, there’s also a given personality type we carry our whole lives. K, I just this morning I discovered two bruises of unknown origin on my right leg. I found them when I was checking out my scratches from falling through the shrubbery after I had been cleaning windows. I had to climb over them to get to the window, which I did with no problem, but getting out was another matter. As fate would have it, of course I took that tumble just as my next door neighbor (the FBI agent) was leaving for work with his daughter. He’s a gallant type so he might have offered to help me if he had seen, so I’m hoping he didn’t see me trying to get my legs untangled from the branches without totally destroying the plant. Just another day here at the Defeat Despair household. YES, here’s to surviving another day! Yes, it is surprising how much of our personalities seem to be encoded into our genes. Drew never really knew my maternal grandfather, but his voice, gestures and mannerisms remind me so much of him. He definitely is a care-taking type, and sometimes that worries me; I know how easy it is to slip into what 12-steppers call “codependent” behaviors. Like Jeff, Drew is an overly-nurturing type, and from there it’s easy to cross the line into an unhealthy feeling of responsibility for others’ safety and happiness. Still, I prefer seeing people care TOO much, rather than not care enough. !! OMgosh, snaggled up in tree’s? Rolling out of the bush? I’m holding in a roar (I’m relieved you didn’t get hurt) because that must have been a scene to see. Good grief Julia, you are too funny. I could almost see that happen in an old episode of, ‘I Dream Of Jeannie’ or ‘Bewitched’. The FBI guy and daughter look back, “did you hear something?” he says to her with a confused look on his face…..LOL.